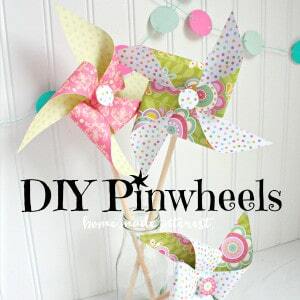 DIY Pinwheels - Home. Made. Interest. 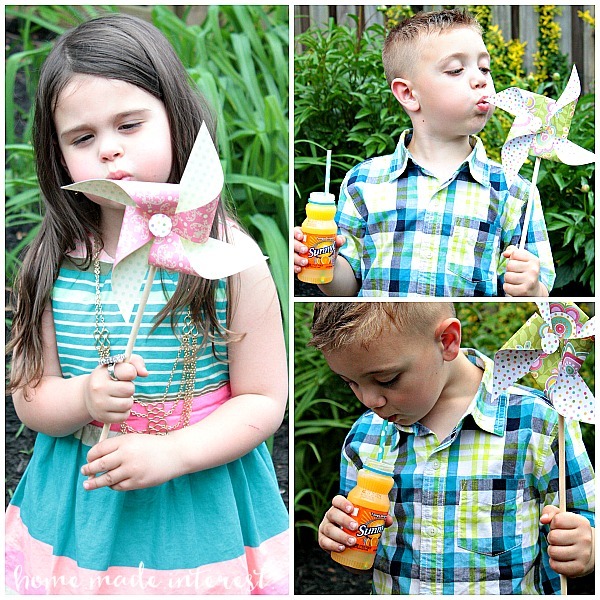 DIY Pinwheels are a simple craft that is tons of fun to make with the kids this summer! Spring is flying by and summer is just around the corner!! We had a gorgeous weekend last week and instead of cleaning house and going grocery shopping I spent the day with the kids. We made our own pinwheels for the first time and we played outside in the sunshine all afternoon. I even had an extra special treat for the kids (and me). When I was at Sam’s Club the other day I found SunnyD! Do you remember SunnyD? It was one of my favorite things when I was a kid. I used to drink it all the time. I didn’t even know they still made it! I was so excited when I saw it I grabbed a 24ct. case in the Tangy Original flavor. I let the kids pick out their favorite colors from my stash of scrapbook paper and I cut the paper into quarters to make small squares. Since my hole punch wasn’t big enough to reach to the middle of the paper I folded it in half and cut half a circle…which made a perfect circle when I unfolded it. 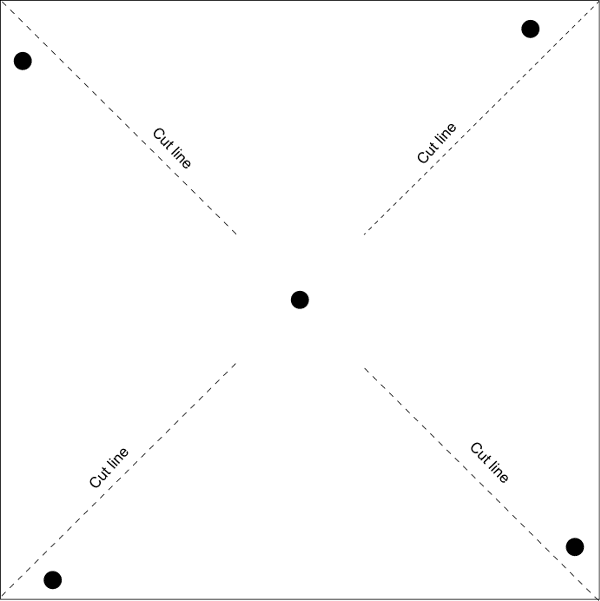 Then I made a diagonal cut from each corner in toward the middle, stopping a short distance from the hole in the center. Once the cuts are made punch a hole in the left corner of each of the triangles. If you look closely at the middle image you can see how I put a glue dot on either side of the hole punch. Then I folded the corner in, lined up the hole with the center hole and pressed it down to glue it in place. I repeated this for each corner. To attach the pinwheel to my wooden dowels I stuck the pushpin through the middle hole and pressed it into the wood dowel. Don’t go all the way in, you want a little space between the dowel and the pinwheel so the pinwheel can spin. To hide the push pin I put a glue dot on the end and used a nickle to trace a circle on scrapbook paper. Then I cut it out and glued it on the end of the push pin. They turned out so cute and the kids loved them! They had so much fun running around outside with them and it turns out my son loves SunnyD as much as I do. He couldn’t get enough of it :). 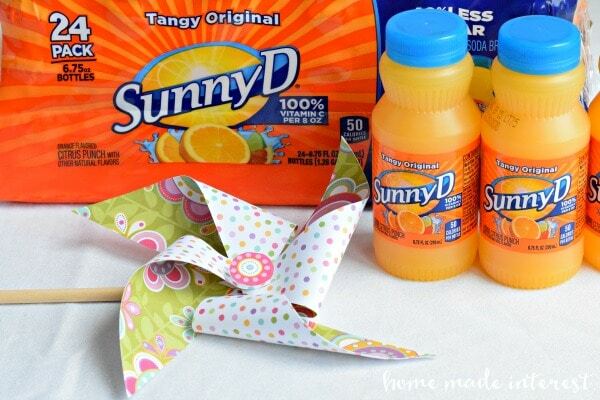 SunnyD +Pinwheels = Endless summer fun ! I love making these kinds of memories with my kids, they are growing up way too fast. 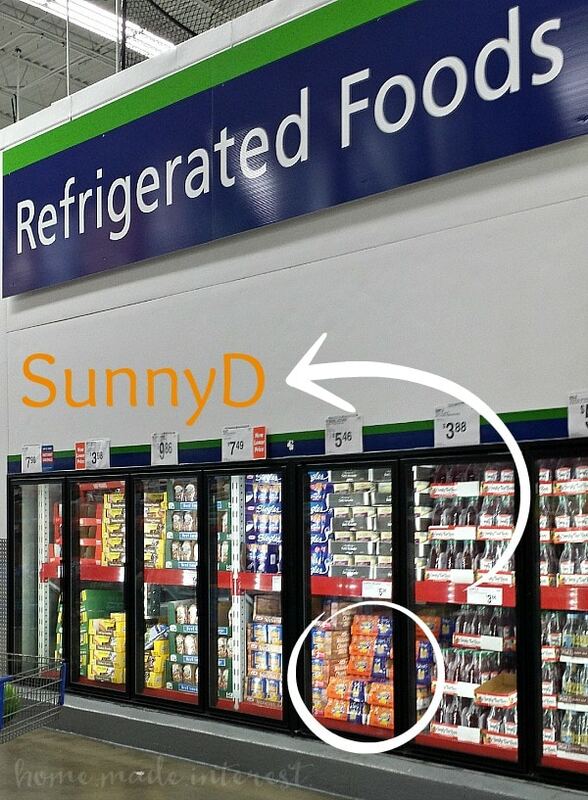 You can find SunnyD on an end-cap display in Sam’s Club from April – July (vs. the usual spot in the refrigerated section) and they are on rollback from $5.38 vs. the original retail price of $5.98 until the first week of August. What fun things do you have planned for this summer? Let us know in the comments! I love this, I read a post last week about using pinwheels as garden markers. And now one on how to make them. I might need to use something a bit more substantial than paper, but other than that I’m looking forward to the end result. A fun idea for summer, and something kids always love! 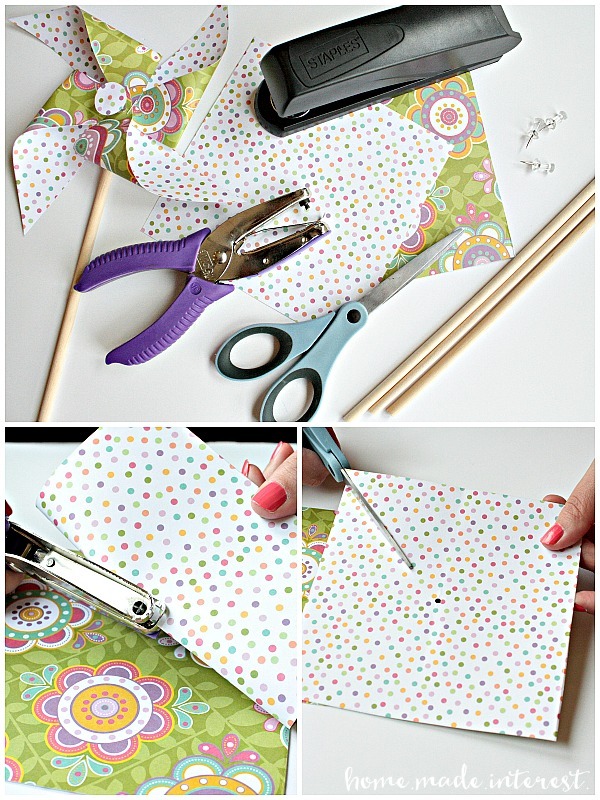 Oooo these look like fun, pinning it for later DIY project! I used to make these when I was a kid, and then with mine when they were little. We didn’t used to glue the the points like you have but looking at your pictures I imagine yours would probably spin better than ours used to! Lots of fun memories though – thanks. What a great idea!My niece will love it! I’m sure the kids did have a ball with these. What is better than pinwheels? 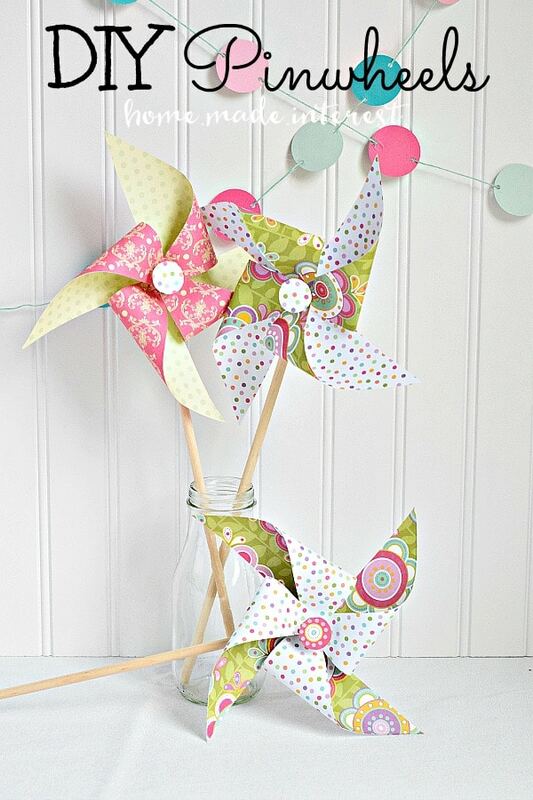 Pinwheels that have been made yourself! I have been looking for a tutorial for pinwheels and found yours displayed at “Tater Tots and Jello”! Yeah! Thank you for this easy tutorial. I wanted to replace the plastic pinwheel I bought for something a little more colorful. I’ll being pinning and using this one for sure! I am sure the kids loved them!! I remember them always being fun! Thanks for sharing this at Bewitchin’ Projects block party! I hope you will join us agin this Sunday!! Hopping over from Inspire Me Monday. Cool, cute idea! My kiddies are adults now, but my nieces and nephew have small fries of their own. I will definitely share this with my FB friends & family. Oh yeah, I’ll give you a tweet out, too! great idea for kids fun ………….